You see, Brian Azzarello and Eduardo Risso’s masterwork was the first Vertigo title I ever read, and it marked something of a significant turning point in my comic buying/reading habits. In short, they weren’t quite as…well, developed as they are now. Unfortunately, there were large segments of the Previews catalog that I still wasn’t paying any real attention to, great writers that I barely knew existed, and a host of other egregious errors too embarrassing to mention. Until I met this dude named Nate back in college, who I was introduced to by someone who thought we’d hit it off real well because we were both obsessed with comics. Important difference though, Nate was obsessed with different comics than I was, and nearly all of them were better. My main pull list was still extremely mainstream at the time, and I hadn’t been exposed to many of the books considered to be the pinnacles of our medium. The only Alan Moore material I’d read was published by Image Comics, which Nate considered a crime against nature. 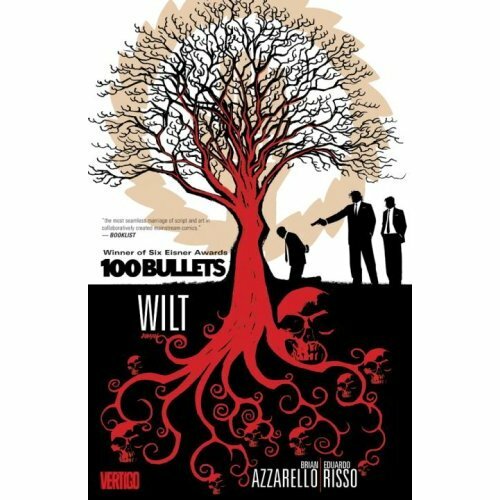 So I received a crash course in all the things I should’ve been reading already, and on top of a heavy dose of Alan Moore, one of the books he gave me was 100 Bullets. To say that it was unlike anything I was reading at the time would be an understatement—there were no capes, it was done by creators I had never heard of, it was a crime drama, and a bunch of other little things that really exemplified how limited my relationship with comics actually was at the time. I remember being so impressed by the initial premise of the series, and the flawed characters, and the over-arcing conspiracy building with every seemingly unconnected story. The fact the first arc is set firmly within Chicago was something that appealed to me as well. For my particular purposes, there was really no better introduction to the Vertigo imprint and what it represented in the world of comics. And I’ve finally finished re-reading the whole glorious series from the very beginning, and naturally, I have a few thoughts. Saying the series is fantastic simply doesn’t even begin to cover it. As long as Azzarello and Risso are doing comics (and likely after that) this will be the series that people consider their creative masterwork. Sprawling, brutal, thrilling, layered, really everything you want from a great crime story is in place from start to finish. But while the over-arcing conspiracy, and its many twists and turns, is great fun, the biggest hook for me has always been the characters and their continual evolution over the course of the series. The constant betrayals and shifting of allegiances, the subtle manipulations used to trick or coerce people into doing horrible things to one another. And how despite the best-laid plans of Agent Graves, it all ends in a rain of bullets and dead bodies, with only a chosen few escaping with anything left intact. It’s easiest to trace the life of the series with that of Dizzy Cordero, the young woman Graves recruits in the very first arc for an unknown purpose. Her tangled life from ex-con to Minuteman unfolds throughout a number of great stories (some she appears in, some she does not) that methodically details the dark history of The Trust, and builds a foundation for its possible future. Everyone Dizzy encounters throughout the series is somehow changed by that initial meeting, which is a truth that extends even to the audience. As she progresses through this labyrinthine conspiracy, Azzarello’s crime epic grows even more complex and even more compelling, as does Cordero and her potential role. In a series bursting with terrific characters, she always manages to stand out, and it’s no surprise that the final page of the entire series features her. For anyone out there that’s never read it, I can offer only my strongest possible recommendation. On top of everything else that happened on the page, for me the first couple issues started a domino effect that ultimately triggered a much more mature and responsible relationship with comics. If not for 100 Bullets (and my guy Nate Lee, of course) who knows how much longer it would’ve taken me to find the really great comics out there, and how that would’ve affected my pursuit to become a professional writer. Thankfully, we’ll never know, and hopefully someday I can write something as enduring and as essential as this fantastic crime story with an unbeatable premise.